Disclaimer: This post is a joke based on a gift that I received this week from my ever-so creative wife. If you are looking for the latest and greatest news regarding the Motorola Droid, coming out on Verizon this Friday, you will need to look elsewhere :) With that said, let's have some fun! 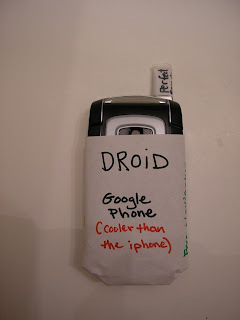 Ever since I heard about the Droid, I've pretty much been obsessed with getting more information about it. 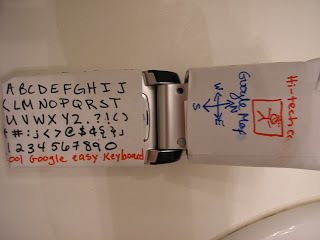 I've been following any Android news website I can find, and also do daily searches on Google news. I am currently a Verizon customer and have long awaited the day when they present their customers with a truly "open" device that hasn't been gimped. Well my friends, I believe Friday is that day. 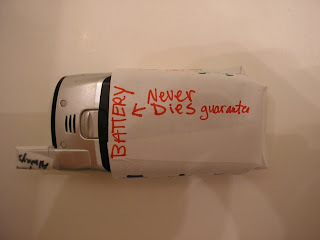 In any case, if I do end up getting the Droid it will partially be because of the mercy of my wife. I just used my new-every-two upgrade this summer to get the enV3 by LG (a great phone by the way), so I'm not eligible for a new phone discount anytime soon. However, my lovely wife, is a bit overdue for an upgrade. 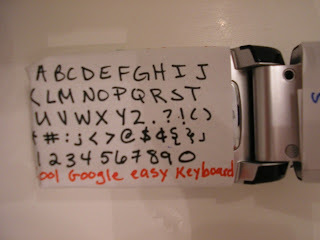 So, I had to convince her that she does in fact want my enV3 and really does want to let me use her upgrade. Well, sometime after having that talk with her, she decided to make a little gift for me: her take on the droid without seeing any pictures or reading any reviews. All she had to go on was things she may have heard me say and things she knew about technology in general -- and mind you, my wife is not a techie. 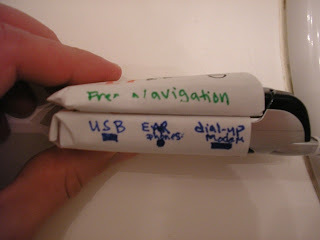 In case you can't tell, the top half says "Free Navigation" and the bottom has "USB", "Ear Phones" and "Dial-up Modem" (Love that one!). 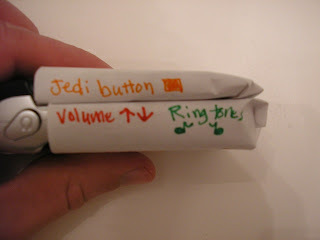 I couldn't stop laughing when I saw the "Jedi Button" -- who KNOWS what kind of power will be unleashed when I press it! 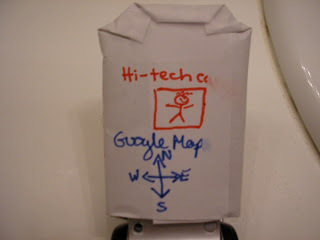 Here you have the "Hi-tech camera" and "Google Maps". All in all, a pretty good device -- don't ya think?